Hi guys! 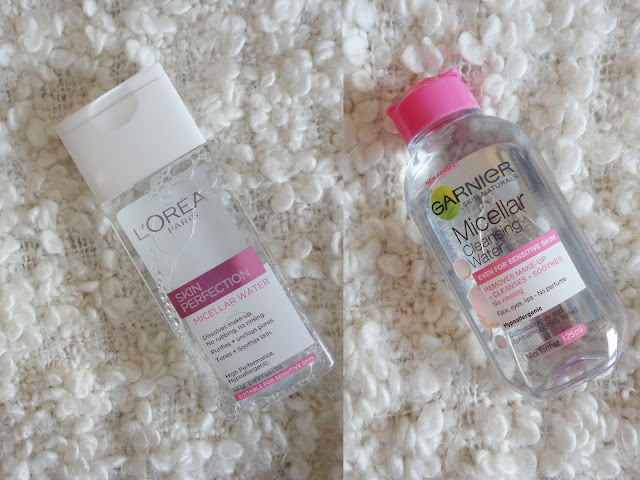 I'm back today to do another little comparison post - this time between the L'Oreal and Garnier Micellar Waters. I've used the L'Oreal for over 2 years now (see my original review of it here), and I recently tried out the mini size of the Garnier Micellar Water as it was more convenient for me to take on holiday with me - you can see that post here. Just incase you were wondering, the Garnier mini format lasted me 2 weeks so if you're wondering about getting it - that's roughly how long it lasts! Personally, when I wear makeup, I tend to do a pretty full face, although generally I don't really use waterproof mascaras, so I can't vouch for how well each of these do with taking that off. Both micellar waters take off makeup well, and I didn't find any makeup coming off on my washcloth when I do a deeper cleanse after using these. Personally, I found the Garnier one took a little longer to take off eye makeup and I had to use a few more cotton pads to really make sure the eye makeup was all off. For this reason, I have to say that I do prefer the L'Oreal one as I've never had a problem with getting any type of makeup off with it. I have read some comments that the Garnier one breaks people out, but I didn't find it to irritate my skin or give me any blemishes at all, so I assume it just depends on skin type and how it reacts to it. Both formulas feel quite refreshing, but I feel like the L'Oreal one feels a bit more like water and feels nicer on the skin. Both formulas are unscented though which is fantastic for sensitive skin. The packaging of each is pretty similar. I found the Garnier one to spill a bit easier and when you apply to a cotton pad it seems to drip more, not really sure why but just something I thought to mention. The price of each micellar water is the same, at £4.99, so it's really just up to personal preference! Here are the links for the L'Oreal Micellar Water and the Garnier Micellar Water. Micellar waters tend to be on offer quite a lot too, so watch out for 3 for 2/half price deals.